Poppy is lonely. Now that summer is over, Suzy and Tim have gone back to school and Mom and Dad are back at work. What’s a pirate dog to do when there’s no one around to help her bury treasure? When her family decides to get her a friend to keep her company, Poppy is thrilled. But when she meets her new shipmate, he is not at all what she expected — or wanted! Will mutiny ensue? In her second full-color early reader, best-selling author Liz Kessler steers a course through the sometimes tumultuous waters of sibling rivalry through the eyes of a very funny and slightly neurotic pup. Liz Kessler is the author of the first book about Poppy as well as the best-selling middle-grade series about half-mermaid Emily Windsnap, the Philippa Fisher series, and the novels A Year Without Autumn and North of Nowhere. She lives in England. Mike Phillips has been illustrating children’s books for twenty years, from picture books for the very young to the gruesome Horrible Histories. He lives in a small fishing village in England with his family and dog, who, believe it or not, is also named Poppy. The easy reader/beginning chapter book format, with its heavy, black typeface against plenty of clean white space and the simple sentences and vocabulary, is as inviting as the book’s endearing canine hero, and kids not quite ready for lengthier chapter books will find this title (the second in a series) a fine transitional bridge. Phillips’ frequent ink and watercolor illustrations are lively and entertaining, and ... Poppy and orange tiger-striped George are overall a pretty winsome pair. With a simply written story and jaunty, expressive ink-and-watercolor illustrations, this engaging book works equally well as a choice for independent readers or for reading aloud to younger children. 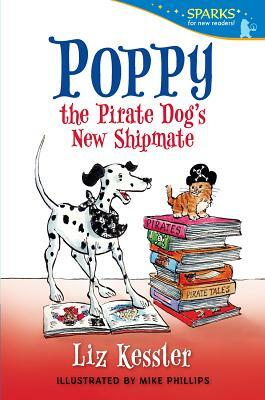 A fine addition to the Poppy the Pirate Dog series.